Surely Marquis Leisure didn’t expect this level of success? As the exclusive UK distributor for Benimar – a sister brand within the Trigano Group – it only took two seasons before it was able to claim the top spot for imported sales. And that was for the initial Fiat-based Mileo line-up. 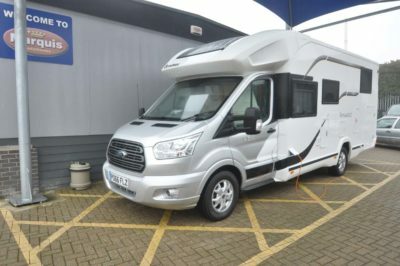 2017 saw the introduction of Tessoro, a five-model line-up of coachbuilts all on Ford’s Transit. 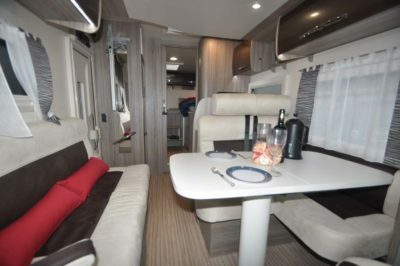 The 463 here is a full four-berth that espouses what’s obviously a winning formula – keen prices and a very high standard specification. If you think corners have been cut on the bodywork, think again. It’s a GRP-clad, almost totally wood-free construction, complete with upmarket flush-fitting windows. There’s no stinting on the Ford side of things, either. The highly impressive 170bhp engine is fitted as standard – it’s quiet, smooth and powerful – and the recently-announced automatic transmission option is sure to be a key attraction. The cab is pretty car-like, too. 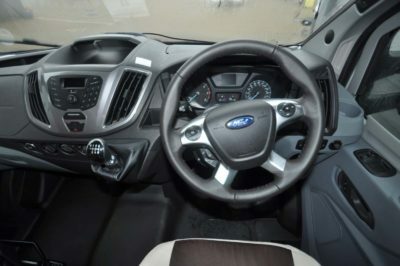 That leather-clad steering wheel includes controls, while air conditioning and stereo system with USB connection and Bluetooth add to the quality. The slightly loose covers are the only real disappointment in the cab. 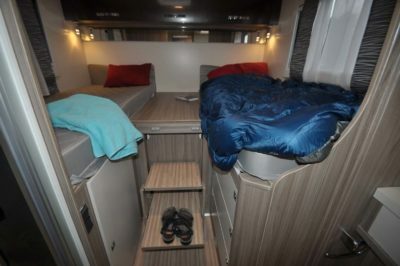 Overall length may be just shy of 7.5m (24ft 7in), but that’s actually short for a four-berth that includes two permanent single beds. 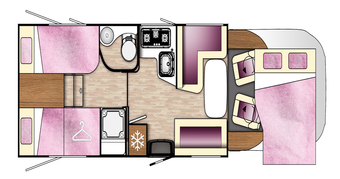 The secret is a drop-down bed over the lounge which, in turn, frees up enough space for the galley kitchen mid-‘van. 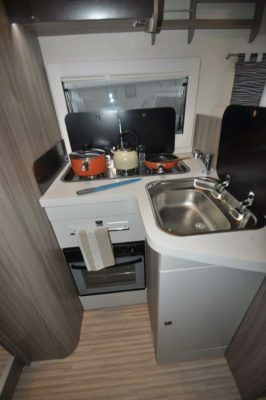 The main unit here is L-shaped, with a three-ring hob and stainless steel sink, plus a combined oven and grill. The latter is set a little low. Directly across the corridor is a Thetford fridge with freezer compartment and chilling drawer, offering a total 141 litres of cooling space. 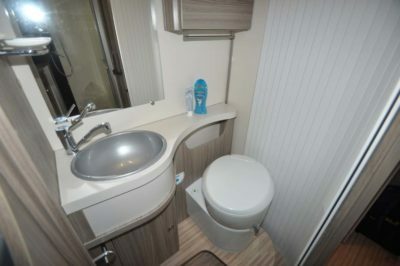 Washroom facilities are en suite to the rear beds – with a plastic-lined shower cubicle on the offside and a separate room for the toilet and handbasin nearside. If you’re touring as a couple, it makes sense to leave the lounge seating in its slight L-shaped mode. There’s also an inward-facing settee as well as the swivelled cab seats, all around a fixed pedestal leg table whose top is hinged – it makes getting past it all the easier. At the back, fold-out steps make for easy access to those high-set single beds, below which is an extensive garage storage area. Be warned, though, payload isn’t that generous. On the other hand, it’s hard to see what the Tessoro lacks in specification, unless you want something like a satellite TV system. The lack of electric operation for the Truma Combi heating and hot water system is a slightly strange omission in an otherwise highly impressive list of standard kit. 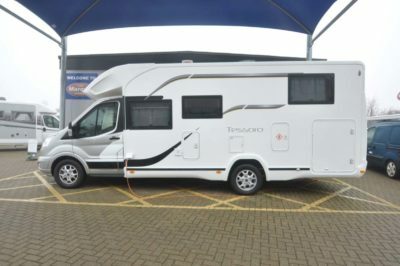 Solar panel, cab window blinds, 16in alloy wheels, lots of LED lighting as well as mains/12V/USB sockets, flatscreen TV holder, overcab sunroof, and reversing camera … you don’t pay a penny more for any of this and will get a small discount on your motorhome insurance with Caravan Guard for the reversing aid. Maybe Benimar is Spanish for bargain! Safety & security Electronic immobiliser, remote central locking to cab doors, twin airbags, cruise control, ESC, hill-start assist, smoke and carbon monoxide alarms, reversing camera, heated door mirrors.